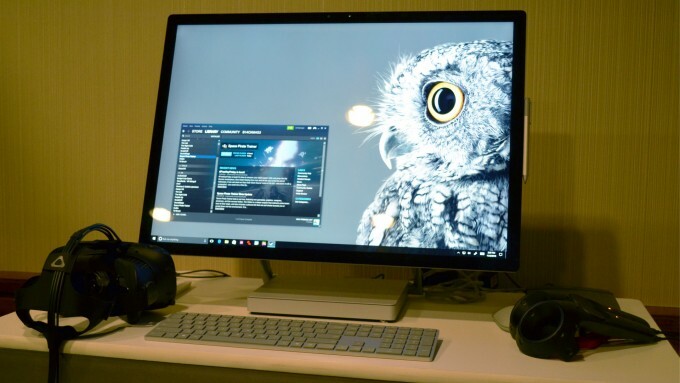 Announced just last week, Microsoft’s Surface Studio all-in-one computer has been met with excitement and touted as an example of the company’s new approach to innovation. With a mobile GPU on board, you shouldn’t expect to be able to run the most demanding VR titles, but Microsoft says Surface Studio will be able to manage some VR experiences. Microsoft says Surface Studio is made for designers and creators. The computer’s crowning feature is a huge 4500 x 3000 display that gracefully tilts down to make the touchscreen and stylus-enabled display ready for hands-on interaction. And while it may have a relatively small footprint, the company is trying to play up the device’s performance. Microsoft was at VRDC 2016 in San Francisco last week showing the Surface Studio powering an attached HTC Vive. 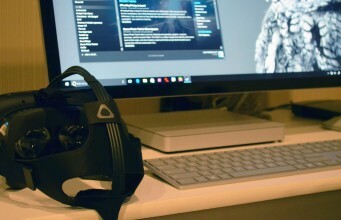 Given that the computer includes a mobile GPU (which neither Oculus, HTC/Valve, or NVIDIA have explicitly approved of as ‘VR Ready’), the company isn’t going so far as to say that Surface Studio is properly VR Ready, but they do say that it’s capable of handling lighter VR experiences. I was told that this wasn’t an inclusive list of VR games the system could handle, just that these made for good first-time VR demos. I hopped into Space Pirate Trainer and blasted my way through a few waves of deadly robots and it all worked as expected: smooth 90 FPS gameplay on the Vive. It’s nice that the Surface Studio can handle some VR, but the fact that it doesn’t quite qualify as a VR Ready machine means that none of the above titles will necessarily work in perpetuity as they are being built with a different recommended specification in mind. Oculus’ new “minimum” (not “recommended”) specification could give the Surface Studio a bit more breathing room for handling VR experiences. The ability to play “light” VR experiences on Surface Studio is going to weigh heavily on your wallet. At the event, I was shown the top-end configuration of the computer which includes a Core i7 processor, 32GB of RAM, and the GTX 980M GPU, for a cool $4,200. Lesser models only have the GTX 965M, which is less likely to be able to push frames as fast as VR demands. Why didn’t Microsoft just go with one of NVIDIA’s new VR Ready 10-series mobile GPUs? An engineer from the Surface team told me that the Surface Studio spec was locked down some time before that line was introduced; it seems likely that future iterations of Surface Studio will pick up a 10-series card at a minimum, and be properly VR Ready across all configurations. The post Microsoft Says New Surface Studio is VR Ready(ish) appeared first on Road to VR.